Matt Bai is an author, journalist, screenwriter and Yankee fan. He’s also one of the nation’s leading voices on American politics. 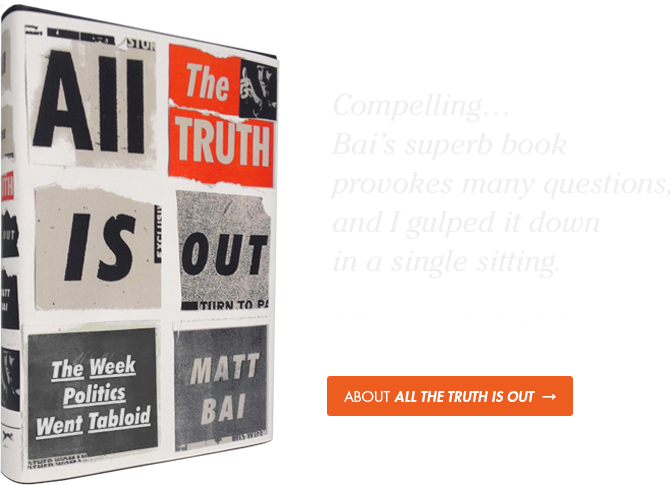 His second book, All the Truth Is Out: The Week Politics Went Tabloid, was listed among the best books of 2014 by NPR and Amazon.com. Matt also co-wrote the screenplay for the film adaptation, "The Front Runner," directed by Jason Reitman and starring Hugh Jackman, which will hit theaters in November 2018. Matt is the national political columnist at Yahoo News, which he joined in January 2014. Before that, he was chief political correspondent for the New York Times Magazine, where he covered three presidential elections, and a columnist for both the magazine and the Times. Everything you ever wanted to know about Matt (including his brief but stellar acting career) is in his official bio. Matt’s Political World column for Yahoo News appears every Thursday, except when he’s on a rare vacation or can’t think of a single thing to say. You can read his latest columns by visiting Yahoo Politics and looking for the "Matt Bai" tab at the top. Got an audience that might be interested in the takeover of tabloid politics… or in the state of political journalism… or in the way that social media is transforming government? To inquire about availability, contact the Penguin Random House Speakers Bureau. Or to find an upcoming book event near you, visit Matt's author page at Alfred A. Knopf.